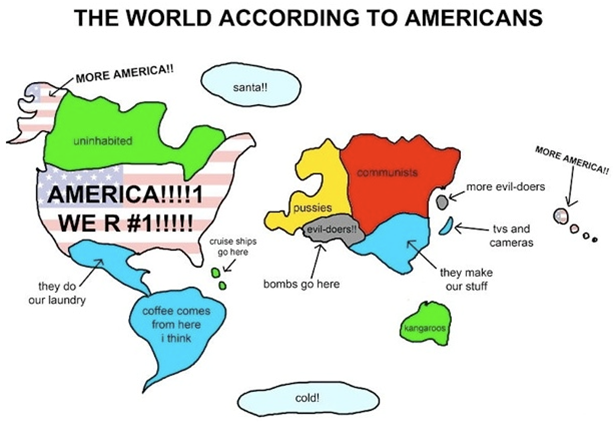 The U.S. citizens’ perspective of the world might not be quite as bad as depicted in this map, but I feel it may be close. While although “we are all one”, and Americans have the best of intentions, the road to Hell is paved with good intentions. In a recent NPR interview, a few large truck and SUV drivers were asked if there were any connection to their driving habits and the Gulf oil spill, and, did they feel any remorse. They said “no”, they still needed “to get to work, and deliver the farm goods”. We’re all part of this problem, even the Amish, most of who don’t drive. They still need and send deliveries sent by truck. As Tolle asks, “Are you cleaning up the mess or contributing to the problem? Back to the American perspective. This map illustrates the longstanding isolation and provincial perspective that seems unique to the USA. Just across the border in Quebec, the world view is, more worldly. The U.S. is a young country full of many, but not all, who still think we’re on top of the world. It’s understandable. Our continent stands alone, our controlled media* and corporatocracy has perpetuated a tunnel vision for many years that is catching up to us. This narrow vision that has been sold to us, effects not only our global view, but our environmental abuse, and our imperialistic tendencies. At Mountain Spirit Institute, our mission is to broaden the American perspective. See our programs on Peru and the USA/Peruvian Music Exchange where a bit of Peru was brought into the schools and communities in the Northern U.S.
What do you think about this map? We invite your comments. Thanks to Amanda Richards for sending this map my way. She was a little apprehensive about my posting this, but I thought, “Heck, our readers have a good sense of humor”. This entry was posted on 07/06/2010 at 10:06 and is filed under Conservation, Environment, Fair Trade, Holistic Living, Sense of Humor Perspective, Sustainable Living/Communities. You can follow any responses to this entry through the RSS 2.0 feed. You can leave a response, or trackback from your own site.